Spend more time connecting with prospects, less time dialing. Complete your Outreach call tasks in minutes, not hours. The integration prevents past due task buildup by transforming one-at-a-time call tasks into high-velocity ConnectAndSell sessions that execute in minutes instead of hours. The result: no more stalled sequences waiting for completed call tasks, higher campaign velocity, and a complete view of performance for all campaigns across all channels. ConnectAndSell combines patented technology with human intelligence to navigate voicemail, IVR phone menu trees, and gatekeepers so sales reps can focus on selling. The embedded workflow automates voice nurturing, making it easy to set and manage follow-up call tasks. All call activities executed in ConnectAndSell are logged back to Outreach-- in real time. Create tailored lists consisting of sequenced call tasks, call tasks from a specific sequence, or unsequenced call tasks. Referrals logged in ConnectAndSell are automatically created as new prospects in Outreach. 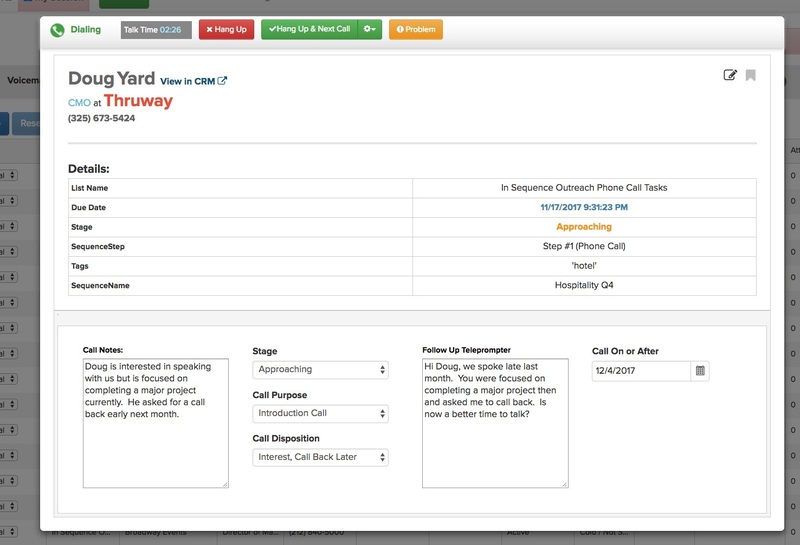 Follow ups scheduled in ConnectAndSell are automatically created as new unsequenced call tasks.